In 1989 a local man named William Roberts made a very unexpected and exciting discovery - an abandoned gold mine in the mountains of Snowdonia. This, of course, was the St. David's mine in Bontddu. He decided that there would be some undiscovered gold still buried within the mine. Luckily there was, and with the help of three local miners, they were able to extract a stockpile of Welsh gold during several years of small-scale mining. Clogau employs its own jewellery designers to fashion this rarest of precious metals into exclusive collections. The designers take much of their inspiration from the themes and traditions found in the Welsh landscape and culture. Each piece is hand finished and then passes through a strict and thorough quality control procedure. This dedication to quality is instilled by William Roberts and his son Ben who run Clogau as a family business. From the traditional bridal range to the well known tree of life collection, the range has something to suit all. A selection from the Clogau range is available in our Online Shop with a further selection in our stores in Crewe and Newcastle. 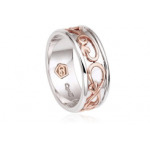 If you cant see a specific Clogau piece please contact us and we will be happy to find it for you.